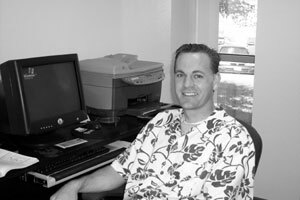 If you are enrolled in a psychology class, make regular visits to the BDAC or call Sessions Residence Hall your home, there is a good chance that you have met or at least run into Dr. Wade Lueck. At 29 he already has earned a doctorate degree in counseling psychology from Brigham Young University, which could easily make him the youngest doctorate instructor on Eastern Utah’s campus. Lueck grew up in Tempe, Ariz., with his three siblings. He moved to Las Vegas, Nev., to finish his high school years. After high school, he moved to Provo, Utah to further his education at BYU. While getting his education, he met and married his wife Ashley. She lives in Provo and is working for NuSkin. Lueck has been teaching for the past four years and has taught at BYU, Utah Valley State College, Provo College, and Michigan State. He chose to teach because he is a real people person, and loves to be around people and students. He loves that he gets to teach people about something that he is very passionate about, his own career. “To me teaching does not seem like a job, interacting with students is just a lot of fun!” he said.